Enjoy chef Daniele Turco’s Venetian cuisine and a fine wine list at this Gritti Palace hotel restaurant. 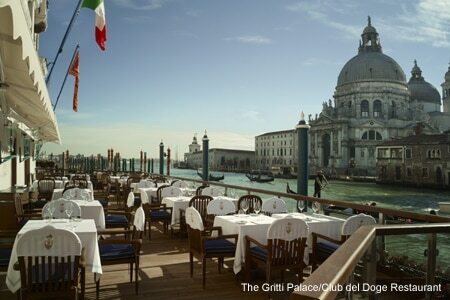 : Club del Doge at The Gritti Palace offers a view of the Canal with its romantic skyline. Helming the kitchen is chef Daniele Turco, whose dishes reflect Venice’s gastronomic tradition. His many travels to the East made him the present day Marco Polo of Italian cooking and especially Venetian cuisine, as he adds light fusion touches to the original preparations. For lunch or dinner, starting with the hors d’oeuvres called cicchetti is almost a must, followed by linguine with shellfish as a primo. Although there are good meat choices, the main course should be fresh fish from the lagoon, such as sea bass filet cooked with its skin, with braised peas and spring onion, hollandaise sauce and blood orange juice. Relaxed and almost satisfied, you will finally sip your after-dinner caffè while eating small spoonfuls of crème brulée topped with house-made fior di latte ice cream. The wine list is as it should be with fine selections from all the regions in Italy, but it includes options from French and other vineyards. Chef Turco runs an epicurean cooking school once a week for those who are interested in learning more about his creations.